With a Guinness PRO12 semi-final guaranteed and the odds stacked against securing a home tie coupled with several key players nursing or carrying injuries, Ulster head coach, Neil Doak, had really only one choice to make ahead of Friday’s match squad announcement. There are 12 changes to the starting team which drew with Munster in Belfast last weekend for Saturday’s game against Glasgow Warriors at Scotstoun (kick-off 3pm). Squad rotation has been deployed to its full with the bench packed with experienced players boasting over 251 international caps. The curtain falls on the regular season in the PRO12 on Saturday afternoon with all six games kicking off simultaneously and some key battles top, middle and bottom. The top four ensured over a fortnight ago they would be contesting the semi-finals, but with only a point between first and fourth, who will gain home advantage in next weekend’s play-offs will only be determined by around 4.30pm. Glasgow v Ulster is the game of the day, pitting second against fourth and given the Scots have not lost at home this season and Ulster travel with a much changed squad missing several front line players, the odds will be heavily on the home side. The Scots will need a bonus point win to secure a home semi-final. They are second on points difference from Ospreys and ahead of Munster by virute of having won one game more – all three sides locked on 70 points. 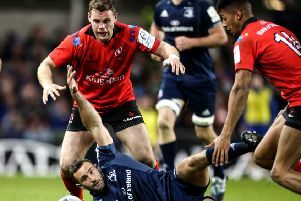 Ulster, on 69 points, are having to rely on either Connacht – who host Ospreys – or Dragons – who go to Cork to face Munster – doing them a huge favour and of course Doak’s side would have to win in Scotland. In Monday’s News Letter I had suggested Ulster should look to rest some of their key players – although that was even before the full extent of the injury list was finally revealed yesterday. Prop Wiehahn Herbst is facing a battle to be fit for next week’s semi-final having suffered a toe injury last weekend, while fellow prop, Callum Black has a hamstring issue which is expected to be resolved in the coming week. Craig Gilroy continues to battle with a niggly hamstring having missed last weekend as a result of picking up the injury in training. On Friday Ulster added Dan Tuohy (hip), Darren Cave (shoulder) Jared Payne (ankle) and Peter Nelson (hamstring) to the list revealing how bad the injury profile currently was. With scrumhalf Ruan Pienaar also having problems with an ankle, the Ulster management team took the view that given there are still potentially two games to come after this weekend, it was best not to full risk other key players. But it is not a case of throwing the towel in this weekend in Glasgow. Doak named Rory Best, Pienaar, Iain Henderson, Paddy Jackson, Roger Wilson and Tommy Bowe are among the bench replacements. If things are close in Glasgow and scorelines in other games are favourable going into the last quarter of the match – Ulster could unleash the star-studded bench and a home semi-final cannot be ruled out. Replacements: R Best, K McCall, B Ross, I Henderson, R Wilson, R Pienaar, P Jackson, T Bowe.